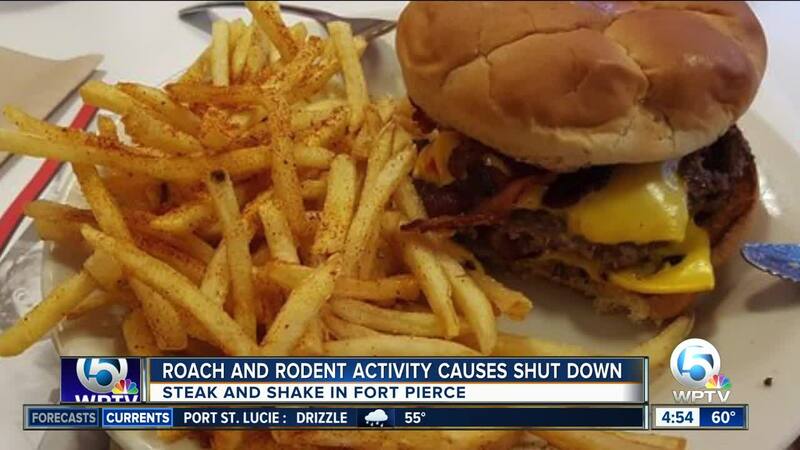 DIRTY DINING: Roaches, insects found at Fort Pierce Steak 'n Shake & 'The Spot' in Palm Beach Co.
A Fort Pierce Steak 'n Shake was temporarily shut down after state inspectors found roach and rodent activity inside the restaurant. On Jan. 4, state inspectors found a dead roach in sugar packets at the Steak 'n Shake on Darter Court in Fort Pierce. They found live roaches, flying insects and 12 rodent droppings inside the restaurant as well. The Steak 'n Shake had eight high-priority violations. State inspectors spotted 21 dead roaches in the kitchen at "The Spot," which is located inside a Holiday Inn on Belvedere Road. They also saw live small flying insects in the food prep area. Inspectors flagged "The Spot" for not putting some of their fish under proper parasite destruction as well. "The Spot" had six high-priority violations. All restaurants have since re-opened.